The Tamboli or Tambuli (also Barai) derive their name from the Sanskrit term for 'betal leaves' (tambula). Tambul or betal leaf packing has commonly been the primary source of income for thousands of Tamboli as they bundle and sell the betalnut and betal leaf product. 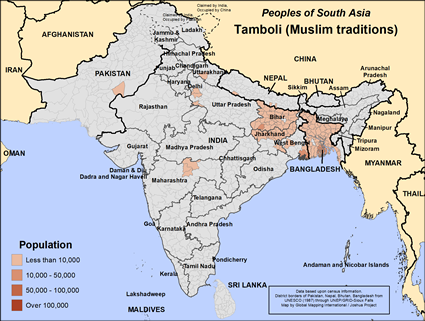 The Tamboli live in India, Pakistan, Nepal and Bangladesh. Today the Tamboli can still be found in India in the tradition business of cultivating the piper betal plant or the areca nut or packaging the leaves in 200 leaf packs for sale and distribution, though not all remain in this profession. Scores of Tamboli , because of a higher or 'clean' caste status, can be found in small business trading and as hardware shop owners. About 90% of Tamboli are Hindus but the other 10% are Muslims and trace this heritage back to conversion from Hinduism. It is believed that about a quarter of the Tamboli in Nepal are Muslims and they primarily speak the Maithili language. Little to no ministry work has ever been done among the Tamboli and despite this large population there are no known Christians among them. 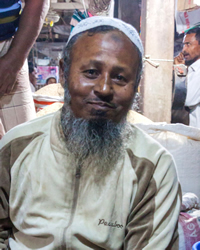 Pray that the betal leaf and areca nut industry could be penetrated with the Gospel so that many Tamboli whether Muslims or Hindus could know the God who created them. View Tamboli (Muslim traditions) in all countries.